Ryman Hospitality Properties and Blake Shelton’s long awaited restaurant and bar Ole Red Nashville is officially open on famed Lower Broadway. The entertainment venue celebrated yesterday, June 6, with a full day of powerhouse programming with national television broadcasts and unforgettable performances from country’s biggest stars. The grand opening celebrations began with Shelton co-hosting the fourth hour of TODAY with Hoda Kotb. “This is happening! This is real! We’re really here!” exclaimed Shelton as he and Kotb took their seats on Ole Red Nashville’s stage. As Kotb and Shelton reminisced on memories made together over their years of friendship, the artist broke out a guitar to serenade Kotb and the audience with a verse of the new establishment’s namesake song, “Ol’ Red.” The co-hosts chose to forgo their traditional glasses of wine for Ole Red Nashville’s signature cocktails, Tishomingo Sunset and Cumberland Punch. 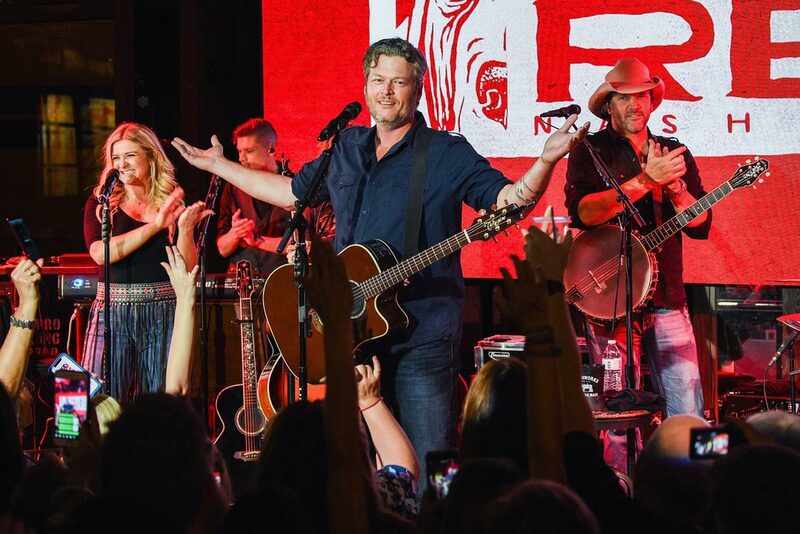 After the awards, the party returned to Ole Red where Shelton officially christened the venue’s stage with an exclusive “Blake Shelton and Friends” concert, where he opened the show with his hit song “Neon Light” and a cover of Hal Ketchum’s “Small Town Saturday Night, and Eddie Rabbitt’s “Drivin’ My Life Away.” In traditional honky-tonk fashion, all of Shelton’s guests covered a high-energy song fans know and love. The all-star lineup included Trace Adkins, Lauren Alaina, Kelly Clarkson, Devin Dawson, Hunter Hayes, The Voice contestant Kyla Jade, Chris Janson, Jon Pardi, Raelynn, Michael Ray, Darius Rucker, Dan + Shay and Little Big Town. NASCAR driver Clint Boyer also made an appearance to sing John Anderson’s “Seminole Wind” on stage with Shelton. Shelton closed the show with a collection of his hits mixed with 80’s and 90’s country classics, including George Strait, Conway Twitty and Rhett Akins. “I can’t believe this actually happened” announced an ecstatic Shelton as he thanked the crowd. Ole Red Nashville is now officially open to the public, with operating hours of 11 a.m. to 2 a.m. Fans who missed Blake last night can purchase tickets to his double show at the Grand Ole Opry tonight here. Everyone is invited to join in on the fun as celebrations continue all week long with live music programming presented by Spotify.